Febreze 3volution plug-in starterkit with Odourclear technology continuously cleans away tough lingering odours. Leaves a light fresh scent for up to 90 days (if used 12 hours a day at minimum setting). Air freshener 3Volution plug in starter kit (diffuser and refills). Cotton Fresh fragrance is inspired by the freshness of pure white cotton. Doesn't mask but truly cleans away tough lingering odours, leaving a light fresh scent. Use with Febreze 3Volution refills. Each refill lasts up to 90 days (if used 12 hours a day at minimum setting). 3 scents alternate every 45 minutes so you always notice them. Adjustable scent intensity. Wide range of high quality fragrances. 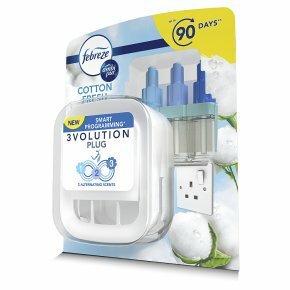 Febreze 3Volution Air Freshener Plug-In Starter Kit with Odourclear technology continuously cleans away tough lingering odours, leaving a light fresh scent for up to 90 days (if used 12 hours a day at minimum setting). Cotton Fresh fragrance is inspired by the freshness of pure white cotton. Let a sense of calm envelop you as this clean & gentle scent fills the air. With normal plugs we get used to scents quickly, which means we eventually stop noticing the scent around us. Febreze 3Volution air fresheners solve this problem by continuously & automatically alternating every 45 minutes between 3 complementary, high quality scents, for a continuous fresh experience. Use the Febreze 3Volution device only with Febreze 3Volution refills, sold separately, to fill your home with air freshness and fragrance that you will keep noticing day after day, week after week. The adjustable diffuser also lets you decide on the intensity of the scent, helping you to create the ambiance that you want for up to 90 days. And for instant freshness, try the full range of new Febreze products with the unique Odourclear technology, such as Febreze Fabric Refresher, Air and Car Freshener. People suffering from perfume sensitivity should be cautious when using this product. Air Fresheners do not replace good hygiene practices. Important safety information: Avoid hard knocks. If diffuser fails or is damaged, remove from socket. Do not open the device. To clean the appliance, unplug and use dry cloth. Retain this pack for future reference. Do not touch with wet hands or metal objects. Do not fill bottle with any liquids. Do not cover or paint unit. Do not place on or near polished, painted or plastic surfaces. Do not use in confined spaces. Wipe up any spills immediately. Causes skin irritation. Causes serious eye irritation. May cause an allergic skin reaction. Toxic to aquatic life with long lasting effects. Keep out of reach of children. Avoid contact with skin and eyes. Wear protective gloves. IF ON SKIN: Wash with plenty of water. IF in EYES: Rinse cautiously with water for several minutes. Remove contact lenses, if present and easy to do. Continue rinsing. IF SWALLOWED: Immediately call a POISON CENTRE/doctor. Do NOT induce vomiting. Do not ingest.